Almost 6 months ago, we ventured out into the world of owning our own businesses. We are following our dreams of being financially independent, with two new small businesses, and so far and god-willing, we are doing it debt-free. We’re keeping our family as our priority in this busy stage, and all the savings add up. So, how are we paying for everything and insurance too, with two young children and two new small businesses? First of all, God provides and opens doors. Second, we save money on insurance. We had just recently re-evaluated our home and auto insurance about a month prior to going on our own and realized we could save $1,000 per year with similar coverage by switching! We had already made the switch and paid for the year ahead for home and 2 cars, and received a refund for the unused portion of our other insurance. If you haven’t re-evaluated your insurance in several years, you owe it to yourself to take the time and do it. We had been so loyal to our insurance company- we had never switched in our married life! Every time we’d receive a renewal statement and the cost kept ticking up, $30 or so each six months. We have always liked our insurance agent, you know, the hometown guy, that we hated to switch. I am a saver; it’s in my blood. This is one area I had just left alone. The new company is just as reputable; they happened to have better rates too. Thankfully, God provided this opportunity to switch before the need was obvious. Starting two small businesses means you’re now expected to provide your own insurance! Yay! When we looked into it, we soon realized the costs for health and dental insurance are outrageous! Our dentist office was gracious enough to tell us about a dental savings program, which is like insurance but not. Basically, we pay drastically less on the monthly fee ($7.99 per month for our family for just dental, $12.99 per month to include pharmacy-below) than we were paying for his company’s dental monthly premiums. We receive the discounted rate for dental services, so far 40-50% off. Because our dentist is in network with Aetna, we are able to take advantage of this non-insurance for dental visits and services, and save significantly. Learn more about the Aetna Vital Savings Program here. The same discount card above, the Aetna Vital Savings Program, also provides a discount on prescriptions. Just the other day, I used our card on a routine prescription refill, the first time we’d used the card, and I was THRILLED to find out my prescription was 100% covered by this discount card. Okay, this discount card is only $12.99 a month!! This prescription can sometimes be over $100 for the name brand. They filled it with generic, but for $0 cost, I am fine with that! If you need better coverage for prescriptions or dental, you should check into the Aetna Vital Savings Program. Even my pharmacist said she pays more for her prescription of the same and was going to check into this card. When we evaluated the options for health insurance on our own, we were floored by the costs! Given that we are a relatively healthy family, paying $1,000 or so a month for health insurance with two new small businesses and all of our other expenses seemed crazy. We were fortunate to hear of Medi-Share, which is a Christian ministry that helps members with health expenses. While Medi-share is NOT INSURANCE, meaning they do not guarantee payment of medical bills, it is an approved legal alternative that is exempt from the Affordable Care Act. *Of course, consult a professional for advice in meeting the legal requirements. This is my experience only. * Through Medi-share, members are responsible for paying their own medical bills. You do receive a discounted rate on medical services like you would if you were with an insurance provider. Once you meet your maximums, your bills are shared with other Medi-Share members. Those members’ monthly shares (like insurance premiums) help to pay your medical bills. Also, those members receive your name and can pray for you. Even more, Medi-share encourages members to sign up for a telehealth account so that when you are sick, you can access a board-certified physician 24/7, 365 days a year via teleconference on your couch for $0! They also give you a discount card for prescriptions, which I have not had to use because we used the Aetna Vital Savings card. It’s solutions like these that keep the costs down and make health “insurance” affordable for us. In this post alone, I’ve outlined ways to save significant money – over $11,000 annually- on insurance!!! 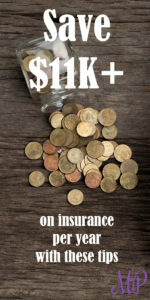 Through evaluating your home, auto, health, dental, and pharmacy insurance plans, you can save money on insurance too! God has provided, and continues to open doors and show us ways to save money. I sincerely hope these ways help you in your time of need. If you need ideas on how to save money in your current situation, Mom’s Priority is a great place to start. You don’t want to have to make decisions about your life/future based on immediate needs. We have a family to feed, house, and clothe, so having money in savings made the difference for us. Please comment if I can help you. Don’t miss these ways to save and live your priorities.